Jeff Brown has made quite a name for himself on the traditional side of the bluegrass ledger in recent years. After several years touring with Larry Sparks in the ’90s, followed by time with The Charlie Sizemore Band, Brown has been building a career as a bluegrass singer and bandleader, now touring with his own group, Jeff Brown & Still Lonesome. And lonesome is the exact right word to describe his music. Deeply rooted in the Stanley sound of the Virginia mountains, Jeff sings the sad and tragic songs of Appalachian life where even tales of happiness and joy have mournful overtones. His two albums with Still Lonesome have earned critical acclaim as well as requests for live performances across the US. But behind the lonesome facade has been a real difficulty that he has borne this past twenty years. Jeff is a Crohn’s disease sufferer, a frustratingly chronic inflammatory bowel disease whose symptoms include serious abdominal pain, and a variety of other unpleasant effects that can be crippling when they flare up. It is believed to be an immune disorder at its root, where the body essentially attacks the gastrointestinal system from inside. Somewhat rare in the western world, it afflicts less than .5% of the population, and though effective treatment is available, it is not curable, nor is treatment certain to relieve all symptoms. Jeff has decided to talk about his struggle with Crohn’s as the disease has been causing him trouble of late. His followers on Facebook will have noticed updates indicating that he had traveled to visit a specialist in Richmond and that he had been hospitalized for testing. When we spoke yesterday, he was clearly relieved that the tests had ruled out his worst fears, and that new treatments were being considered. But he wanted to share more about his journey with this disease, one that many people know very little about, especially the debilitating impact it can have on personal freedom. It all started for Jeff around 1998 when he began experiencing unexplained symptoms that were getting worse very quickly. After almost two dozen doctors visits and a lot of trial and error, he met with Dr. Stephen Bickston at UVA Hospital who diagnosed the Crohn’s, and that he had become severely malnourished. He was sent home with a nasogastric feeding tube and for the entirety of the year 2000 he ate no food whatsoever, relying on tube feedings for all his nourishment. If you had followed southwestern Virginia bluegrass closely, you may remember that Brown disappeared from the scene for a while after working with Charlie Sizemore, and this was the reason why, something he has not publicly addressed before. During this time Jeff underwent multiple surgeries, during which his colon was removed making him an ileostomy patient. He received several Remicade infusions and has been on many different types of drugs. His case is sufficiently severe that it has been presented as a case study by UVA. Not exactly how one wants to be remembered! But over the years, through careful maintenance and a variety of drug treatments being found, Jeff is able to live a largely normal life, and travel comfortably on the road. Until a successful treatment regimen is found, Crohn’s patients often feel homebound, uncertain of when the next attack may arise. But this summer, symptoms began to return and he said that old fear resurfaced. “I’ve been having some problems this past 7-8 months. I’d been nosediving, and the treatments weren’t helping so much. Dr. Bickston, now at VCU in Richmond, ordered an MRI which showed a thickening of my stomach walls. He scoped me to rule out cancer. I got that result today and it’s all benign – so good so far. We are now investigating treatments that might help me feel better. At this point, I can’t remember what it’s like to feel good. Mine is a real tough case. They’re always having to adjust my treatment. This last few months have been scary, but I have confidence that it will be getting better now. We also spoke about some photographs we ran recently of Jeff and the band playing at the Gettysburg Bluegrass Festival earlier this month. He remarked that he was glad they couldn’t show how poorly he felt that weekend. To us it shows that Jeff Brown is a real trooper. And that he’s earned the right to sing sad and lonesome songs. Fans can expect him to continue to be there, playing that mountain style music, no matter how he feels. A pat on the back wouldn’t be a bad idea the next time you see him. Jeff Brown & Still Lonesome have released a second single from their current project, A Distant Horizon. It’s The Soul Of A Mountain Man, written by Brown and Mike Bentley. This bluesy number with a familiar bluegrass message kicks off with silky banjo from Mitch Walker, and tells the story of the mountain life that, despite its difficulties and trials, holds the people fast to the land and the culture where they were born. The single is available to radio programmers at Airplay Direct, and A Distant Horizon is offered wherever you purchase bluegrass music. As 2016 comes to a close, it’s time to look back over all of the music that has been released over the past year. From big name stars on major labels to regional bands just starting out, from straightforward fifties-style traditional grass to “acousticana,” folk-flavored music, it’s all come through the Bluegrass Today headquarters for listen and review. Out of everything I’ve heard this year, here are my picks for the Best Bluegrass of 2016 (in no particular order). The title says it all – Blue Highway made it a point to write original songs that sound as if they might have been originally performed years ago. While the group is always solid, this was (in my opinion), their best album in recent years, hearkening back to the nineties and songs like Lonesome Pine, In the Gravel Yard, and the like. In addition, fans who were worried about replacing Rob Ickes need not fret; Gaven Largent proves himself a top up-and-coming talent here. If you know me, you know there are few musicians I respect more than J.D. Crowe. He and his early bands set the tone for so much of today’s bluegrass – Rounder 0044, anyone? Rickey Wasson, Crowe’s longtime lead singer, takes a number of his favorite New South songs and gives them just slight updates here, calling on fellow Crowe fans like Mo Pitney, Adam Steffey, and Ron Stewart (whose ability to play like Crowe is truly amazing) to help him. This is essential listening for any fan of J.D. Crowe or modern traditional bluegrass in general. If you want straight-up, drive-filled, lonesome bluegrass, look no further than Sisk and his excellent band. His latest album – and his first for Mountain Fever Records – checks off all the classic bluegrass themes: country living, drinking, heartbreak, and loving the Lord. The pickers are in top form throughout and Sisk fills the album with plenty of his Stanley-influenced vocals. Lead single Longneck Blues, a duet with Ronnie Bowman, even picked up Recorded Event of the Year at the 2016 IBMA Awards. Did I mention that I love J.D. Crowe? His influence (and that of New South lead singer Keith Whitley) is evident throughout this project, which he produced. The album included several new recordings of Williams’ fan favorites, some country covers, and (I’m sure to the dismay of a few traditionalists) drums throughout. Williams has a voice well-suited to both country and modern traditional bluegrass, and he shows it off well here. I’m already looking forward to another solo album from him. Twenty-five years ago, LRB released Carrying the Tradition, an album that has probably influenced more of today’s young pickers than almost any other. This year, they brought some of that classic sound back with Bridging the Tradition, a great album that combined modern traditional and country sounds. New member Jesse Smathers proved that he fits in quite well with the group, offering strong lead vocals on several songs. The man with the big heart and bigger voice released his second solo album this year, much to the delight of fans of his soulful vocals. He relied on some great songwriters this time around, pulling from the likes of Dawn Kenney, David Morris, Ray Edwards, Larry Cordle, and others. Several of the songs have found radio success, including recent truck-driving hit Turn and Burn. He’s another artist that has a bit of a country tinge to his music, and I’m a big fan of the sound. As good as Volume Five is, you’d expect them to be a bigger name in bluegrass. Somehow, they seem to fly under the radar while continually putting out tracks that tell great stories. I particularly enjoy how they reach deep into the bluegrass catalog, pulling out awesome songs that most listeners had probably forgotten. Lead vocalist and fiddler Glenn Harrell is also, simply put, one of the best male vocalists in bluegrass right now. They’ve had a few big radio hits from this album, and I’m looking forward to the day they rack up a few IBMA awards. It’s awesome to hear a solo bluegrass album from Jeff White, who has spent quite a bit of time in the country world as of late. And what a mix of neat pre-bluegrass songs, classic grass, and more recent numbers! I was probably more excited than I should have been when I heard Run Little Rabbit Run on Sirius/XM radio for the first time earlier this year. Anyone who likes Stringbean is tops in my book. Does this one even need an explanation? They’re the Entertainers of the Year. They’ve recreated one of the best sounds in the history of bluegrass music. They are some of the best musicians to be found in any genre of music. Over the past several years, the Earls have taken the bluegrass world by storm, and I love it. I don’t believe this album received quite as many accolades as their first, but it’s still great. Most of the other names on this list are familiar to almost any bluegrass fan, with several songs on the radio and the charts throughout the year. The Gospel Plowboys are a more regionally-performing band, newly added to Mountain Fever’s roster, but their album Welcome Home stopped me in my tracks when I first listened to it this summer. They have some of the best bluegrass vocal harmonies I have ever heard and a solid selection of songs on this album. They’re another band I’m excited about hearing more from. After spending several years as one of the best sidemen in the business, Jeff Brown is now making his own mark in the world of bluegrass. He seems to have quite a knack for finding solid material, and this sophomore release is proof. He leads a band of exceptional young musicians through a set of great songs. His unique mountain-tinged vocals come through clearly on this one. With the passing of Ralph Stanley earlier this year, it’s good to know there’s another voice out there projecting the lonesome mountain sound. Wayne not only served as producer of this project, but also performed a duet with Jeff on "Back When My Bluegrass Was Green", a song written by Wayne Taylor, Tim Stafford and Kim Williams. Wayne said, "There are times in this life when you are asked to do something totally unexpected, this happened to me when my longtime friend Jeff Brown asked me to help with this record. Great material and great musicians equal a project that I consider it an honor and am very proud to be part of." Other special guests on this project include Adam Haynes (fiddle player with The Grascals) and Gaven Largent (dobro player with Blue Highway). Jeff Brown and Still Lonesome, in conjunction with Radio Bristol, will host a CD Release party to celebrate and premiere the release of A Distant Horizon, on August 26, 2016, at 7:00 p.m. at the Birthplace of Country Music Museum in Bristol, Virginia. Wayne Taylor is also slated that night to be a special guest with the band. A Better Game, the first single from the upcoming Union House Records project from Jeff Brown and Still Lonesome,A Distant Horizon, is released today to radio. It’s a bluesy number from Scott Patrick and Jeff McClellan, in keeping with Brown’s lonesome singing style, and was recorded with his young touring band. Kyle Murphy is on fiddle, Nick Goad on mandolin, Austin Brown on bass, and Mitch Walker on banjo. Jeff takes care of the guitar. Brown is eager to see the full album released on August 26. Wayne is likewise psyched about the record. Mitch Walker to Jeff Brown & Still Lonesome! Jeff Brown and Still Lonesome announce that Mitch Walker will be joining the band on banjo and vocals. Eli Gilbert from Yarmouth, Maine will be returning home to take a teaching position after graduation from East Tennessee State University in May. Eli states : “Touring the country with Jeff Brown and Still Lonesome was an amazing experience and I’ll be forever grateful to Jeff and Sherry Brown for my introduction to the Bluegrass industry. I’m excited to bring more traditional bluegrass to Maine, and I know my buddy Mitch will do great things with the band from this point forward”. touring with The James King Band. Mitch said: “I am very honored and super excited to begin working with Jeff Brown and Still Lonesome. The band is known for playing good bluegrass. I can’t wait to get in on some of that (provided I don’t mess them up too bad). Jeff has been nothing but great and all of the guys are outstanding musicians and even more importantly better people. I cannot wait to get out on the road and play some music with these guys”. lookout for that. You never know, there may even be some surprise guests”. Jeff Brown & Still Lonesome has announced a band change. Banjo man Eli Gilbert is leaving the group. He is set to graduate this Spring from East Tennessee State University, and has accepted a teaching position in Maine after graduation, where he was born and raised. Eli wants to concentrate on his studies this last semester before heading north. Stepping in will be Mitch Walker on banjo. He will start with Jeff at the SPBGMA convention the first weekend in February. Mitch has worked previously with Audie Blaylock and Redline, and with The James King Band. He is also a student in the ETSU Bluegrass program. …and Mitch is rarin’ to go. Brown says that he and the band are working now on a new album for Union House Records, which should be available later this year. Jeff Brown has purchased a bus to facilitate Still Lonesome’s transportation, and has decided to ask his fans to help him give it a name. They’ve set up a special form online to suggest a name, or you can send one by email. In addition, the winner will have their photo taken with the band (and the bus!) at a concert of the winner’s choosing next year. One presumes that a guided tour of the bus will be included as well. Should more than one person suggest the winning name, the prize will go to the first submission with that name. The Bristol Bluegrass Spring Fest is a new indoor festival event to be held March 27-28, 2015 in at the Holiday Inn & Convention Center in Bristol, VA. Other entertainers featured include Blue Highway, Lonesome River Band, Larry Sparks & The Lonesome Ramblers, Junior Sisk, Ralph Stanley II, Marty Raybon, Nathan Stanley & The Clinch Mountain Boys, Paul Williams, Randall Hibbitts, and Kody Norris & The Watauga Mountain Boys. eff Brown & Still Lonesome are very excited to announce that their new means of transportation is a big blue bus. In celebration of this monumental and exciting event for the band, we're having a contest: Name That Bus! Entries should be submitted via our website at http://jeffbrownandstilllonesome.com/mailing_listname_that_bus/ or by email to sherry@jeffbrownandstilllonesome.com no later than 11:59 PM on Monday, November 10, 2014. The winner will be chosen by Jeff Brown & Still Lonesome and announced on Saturday, November 15th. The winner will also be notified via email and announced on the band's Website, Facebook and Twitter. Entries should be submitted via our website at http://jeffbrownandstilllonesome.com/mailing_listname_that_bus/ or by email to sherry@jeffbrownandstilllonesome.com no later than 11:59 PM on Monday, November 10, 2014. The winner will be chosen by Jeff Brown & Still Lonesome and announced on Saturday, November 15th. The winner will also be notified via email and announced on the band's Website, Facebook and Twitter. Only one entry is allowed per person! In addition, the contest winner will have their photo taken with the band and the bus at a concert of the winner's choosing next year! In the event more than one person enters the winning name, the person whose submission was received first will be declared the winner. Anyone associated with Jeff Brown & Still Lonesome including family may submit an entry for Name That Bus contest. However, should their submission be the winning name, they will be ineligible for the prize package. In the event that should happen, the prize package will go to the second choice from the Name That Bus contest entries. Jeff Brown & Still Lonesome want you to "Name That Bus!" Kyle Murphy has been announced as the new fiddler with Jeff Brown & Still Lonesome. He’s a native Californian who grew up playing both fiddle and mandolin with his dad and sister in The Murphy Family Band. Murphy came east to study in the Bluegrass, Old Time & Country Music program at East Tennessee State University in Johnson City. There he plays in the ETSU Bluegrass Pride Band, and returned recently from a tour of Japan where the band recorded a live album. He has a solo project of his own, Eucalyptus, which features his original music. Kyle says that he is happy to have chance to work with Jeff. For his part, Brown is happy to have him on board, and looks forward to working with Murphy going forward after he graduates from ETSU this semester. Murphy joins Austin Brown on bass, Josh Blankenship on mandolin, and Josh Underwood on banjo. Jeff Brown plays guitar and sings lead. Donna Lee, Owner of Buddy Lee Attractions, Inc. (BLA) has announced the expansion of the agency representation to encompass Bluegrass performing artists. The announcement and agency progression follows suit to usher the commemoration of Buddy Lee Attractions’ 50th Anniversary celebration this year and arrives on the heels of the agency’s earlier announcement this week–BLA recently signed THE ROYS to an exclusive booking agreement for worldwide representation. BLA also introduces the addition of Jeff Brown & Still Lonesome (JBSL). Made up of Jeff Brown (guitar/vocals), Austin Brown (bass), Josh Underwood (banjo/vocals), Kyle Murphy (fiddle) and Josh Blankenship (mandolin/vocals), JBSL released its CD entitled BLUE SIDE OF ME (Mountain Fever Records) on July 16, 2013 to high acclaim. The group’s respective single releases from the project, “Coal Mining Town” and “Lonesome Fugitive,” debuted in the Top 15 on the Bluegrass Today charts. Lead singer Jeff Brown is a former Lonesome Rambler (1993-1996). Before the formation of JBSL, Brown played numerous dates and recorded with Larry Sparks and The Lonesome Ramblers on the CD recordings entitled THE ROCK I STAND ON, I DON’T REGRET A MILE, BLUE MOUNTAIN MEMORIES and ALMOST HOME. He also toured with The Charlie Sizemore Band and stepped-in as a “hired hand” to accompany Blue Highway, Dr. Ralph Stanley and the Clinch Mountain Boys, Jesse McReynolds, and received the special invitation from June Carter Cash to play bass for her husband, Johnny Cash. JBSL has performed on world famous stages including the Grand Ole Opry at the Ryman Auditorium in Nashville, TN and appeared on Austin City Limits and Song of the Mountains (PBS). We are proud to announce and welcome Kyle Murphy as the new fiddle player for Jeff Brown & Still Lonesome. Kyle is a very talented fiddle player, mandolin player and song writer originally from Culver City, CA who started playing at a very young age. He is currently a student at East Tennessee State University and a member of the ETSU Pride Band. We are very excited to have him on board with us! Traditional singer and bandleader Jeff Brown has been awarded an honor especially cherished by bluegrassers. Steven L. Beshear, Governor of the Commonwealth of Kentucky, has inducted Brown as an official Kentucky Colonel, an honorary status with a history dating back to the War of 1812. Originally, Colonels were commissioned as a personal protective detail for the Governor, but it has since evolved into a designation of the special accomplishments and service of individuals both within and beyond the Bluegrass State. One aspect of this historic honor has remained, though. Only an existing Colonel can recommend a new one. And that’s exactly what happened here. Jan White, the Mayor of Richlands, VA, put Jeff forward for recognition after he had assisted the city in coordinating entertainment for the first Richlands Freedom Festival, which took place this past weekend. Mayor White and another member of the festival board put Brown forward to be considered as a Colonel. They kept it quiet throughout the process, and Jeff had no idea about any of it until he was presented with the proclamation on Saturday night. He said it was quite a surprise. While Jeff preferred to keep it humble, his wife Sherry was quick to blow his horn. Congratulations to Jeff Brown, the newest Kentucky Colonel. Jeff Brown and Still Lonesome perform bluegrass in a straightforward, traditional style that conjures up visions of Larry Sparks’ Lonesome Ramblers and Ralph Stanley’s Clinch Mountain Boys. Individual vocal credits are not given, but it appears Jeff Brown sings all the leads (possibly excepting the gospel song “Come To Me”), with harmony by bassist Austin Brown, mandolinist Jeff Blankenship, banjoist Josh Underwood, and Noah Brown. Meredith Goins plays fiddle throughout, and Wyatt Rice and Tina Steffey contribute the occasional guitar and clawhammer banjo break, respectively. Both the lead and harmony vocals are all solid throughout the 12 cuts here, and the instrumental work is first-rate. There are several notable cuts on this release, such as “The Water And The Mud,” one of two contributions by Tim Toliver, which refers to an earth-dam washout in 1984, and it would be interesting to know the background story (there are unfortunately no notes on the songs). “Weary Pilgrim Welcome Home” and “Lonesome Fugitive,” (the latter popularized by Merle Haggard) are quite well done, as is “Last Day At Gettysburg” and Larry Sparks’ “These Old Blues.” Jeff Brown co-wrote four of the cuts—“Blue Side Of Me,” “Virginia I Hear You Calling Me,” “These Old Mountain Ways,” and “Coal Mining Town”—all of which are nicely crafted songs. Jeff Brown & Still Lonesome kick off the 27th Annual MerleFest! WILKESBORO, N.C. – The 27th annual MerleFest music festival kicked off Thursday in Wilkesboro. Before most attendees got in, Amy Kelly and Wendy Pratt, of Greensboro, had already laid down two tarps and several chairs in front of the main stage. It’s a spot they hope to keep during all four days of the bluegrass and county western music festival. “Total, I probably have 20 chairs I think we brought 10 down just now,” said Pratt. When Pratt came to MerleFest for the first time 10 years ago, she was alone. Now she knows she’ll be joined by friends she’s met at previous shows. Pratt calls the show affordable family fun. “It’s very affordable if you think about how many artists you’re seeing all the concerts you’re seeing,” said Pratt. While the adults mostly spend their time listening to music, kids are entertained by an arts tent, a dancehall or hanging out with each other on the Wilkes Community College campus. Kelly said she believes the fact that MerleFest is an alcohol-free environment helps keep the festival family friendly. This year, concert organizers have invited 130 bands to perform, the largest gathering of musicians for a MerleFest in the event’s history. MerleFest Director Ted Hagaman said that’s based in part on the number of requests they get from bands to be included in the fest. Concerts begin around 9:30 a.m. and wrap up around midnight each day. Single day tickets for the remaining days of the festival vary between $45 and $60. It’s one of those surreal moments Jeff Brown will remember even as he’s on his deathbed: Meeting Johnny Cash, and playing bass for him. Brown was a member of Larry Sparks’s Lonesome Ramblers at the time, and the bluegrass outfit was scheduled to perform a show at the Carter Family Fold near Hiltons, Va., in 1996. “I noticed the crowd was maybe a little bit bigger than it should have been, but I had no idea Johnny was going to be there,” Brown told The Daily Times recently. “Johnny’s band manager came over and said, ‘Johnny would like to speak to you.’ I said, ‘Pardon me? OK,’ and then I went back in the dressing room, and there stands Johnny Cash. Good Lord — that’s just something you don’t see everyday. To still be awestruck nearly two decades later speaks to how dedicated Brown is to his bluegrass and country music roots. He started playing music at the age of 9, and he and his brother, Tony, formed the Richlands Bluegrass Boys while Brown was still in high school. The group performed at local festivals, fairs, churches and family reunions, and he slowly improved as a musician. That was in 1993; he’d met Sparks on the bluegrass circuit, and when a spot opened up in the Lonesome Ramblers for a bass player and harmony singer, Brown jumped at the chance. Sparks, after all, was a veteran of the Stanley Brothers and Ralph Stanley and the Clinch Mountain Boys, two groups that helped pioneer the bluegrass genre. “I met him in Lenore, W. Va., and he interviewed me for a solid hour,” Brown said. “At first he just wanted me to sing with him, then he told me to go get my bass, and he put me on stage with him that night. To work with a legend I had always musically idolized was a dream come true. I worked three solid years full-time with him and was on four of his projects. These days, he fronts Jeff Brown & Still Lonesome, and when he’s not performing with the band — as he’ll do Saturday night at Music Row of Maryville — he teaches guitar, acoustic bass and serves as the director of the Traditional Music Program at Southwest Virginia Community College, as well as coordinator and co-chairman for the Virginia Mountain Music Festival and the Mountain Music Jamboree. Playing with younger pickers, he said, keeps him young, and tempering their hotshot instrumental firepower with his old-school voice makes for a powerful blend of music. “I’m an old mountain singer who came out of the Primitive Baptist Church, so I have a lot of influences,” he said. “That kind of music, that heritage, that sound in my head, is kind of built into us up here. It’s kind of in the water, so to speak, and when I formed Still Lonesome, I wanted to put some youth around me that can light it up and then bring in an old-style voice like myself to have a traditional sound but a little bit of a progressive edge. 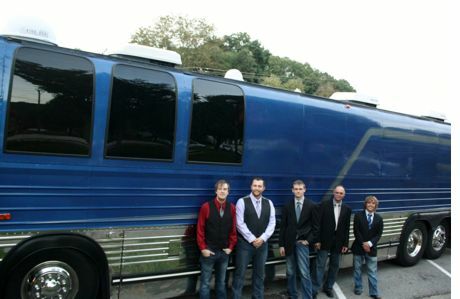 Bluegrass fans in southwest Virginia were in for a treat this past Saturday night (March 15) when the Martha White Bluegrass Express pulled into the small town of Hurley. Rhonda Vincent and the Rage delivered an excellent concert filled with the powerful bluegrass, Gospel, and classic country sounds they are so well known for. The show, which took place at Hurley High School, began with Mountain Fever artists Jeff Brown and Still Lonesome, a great new group based out of southwestern Virginia. Brown recently formed his own band after spending time over the past few decades playing with Larry Sparks, Ralph Stanley, and Charlie Sizemore, among others. Still Lonesome has a fine modern traditional sound and offered listeners a nice mixture of new songs from their debut album, Blue Side of Me, and updated covers of bluegrass classics. The band even previewed a few numbers they hope to include on a new album, due to be released later this year. Among the standout songs of their set were a fiery version of These Old Blues and a pair of songs written about Hurley and the surrounding area –The Water and the Mud and Little Country Town. The writer of the latter song, local boy Randall Hibbitts (who is also the current bass player for Ralph Stanley and the Clinch Mountain Boys), joined Brown on stage for a couple of songs to close out the set. The Queen of Bluegrass then took the stage for a rousing hour-and-a-half set that had the crowd on their feet several times. Vincent delivered powerhouse versions of several of the songs from her brand-new album, Only Me, including a fantastic version of the title track. While the song is a duet with Willie Nelson on the album, Vincent joked that so far, Nelson has failed to show up to sing his part during a live show. Other highlights from the new record included the George Jones hit When the Grass Grows Over Me and It’s Never Too Late,a Gospel number with a strong message penned by Haley Stiltner. The Rage was in fine form, as usual, and each band member took a turn in the spotlight during the show. Hurley is located right in the middle of coal-mining country, which made dobro player Brent Burke’s Girl from West Virginia a hit with the crowd. Josh Williams offered up an enjoyable version of the old standard Walkin’ Down the Line, while Aaron McDaris’ banjo picking was top-notch on an excellent rendition of John Henry. Rhonda Vincent and the Rage put on one of the best live shows in bluegrass today, and they certainly didn’t disappoint while in Hurley. Added to the strong set from Jeff Brown and Still Lonesome, the evening was surely a delight for bluegrass fans. Blue Side of Me holds at # 4 for several consecutive weeks. Blue Side of Me remains in the top 50 for several weeks in a row - coming in at #32 this week! Lonesome Fugitive debuts at # 14 for the week of October 18th. This is the second song from the current CD Blue Side of Me that has debuted in the top 15 with the first being Coal Mining Town. Coal Mining Town debuts at #12 for this week on Bluegrass Today Charts. That question is deliberated and argued over and over on the bluegrass list (bgrass-l). The default answer is “I know it when I hear it.” I suggest people listen to Jeff Brown’s new CD because they will certainly hear it then. Jeff Brown toured with Larry Sparks and still records with him occasionally. He’s also toured with Charlie Sizemore and played spots with a number of other famous bluegrass names. He plays guitar and sings on this CD and has made a good selection on songs, some co-written by him. One of his numbers is the title cut, featuring a strong banjo kick from Josh Underwood. Austin Brown, Jeff’s son, plays bass and provides a solid footing for the band throughout. The subject is a familiar one that so much music addresses, heartaches and heartbreaks, but the song is uptempo with a good melody line and good harmony vocals. The other bookend is their take on Merle Haggard’s “Lonesome Fugitive.” It features a breakneck banjo roll while the bass and vocalists are at half that speed (but still a lot faster than Haggard did it). It’s hard to improve on a Haggard original but they hold their own on this one. “Virginia I Hear You Calling Me,” another Jeff Brown song, has been recorded by Ralph Stanley II on his Born To Be A Drifter album. Another song that may sound familiar is an enthusiastic version of “Weary Pilgrim Welcome Home,” previously released by Larry Stephenson (2006). If the title rings a bell it may be because these are the closing words of the last verse of “Life’s Railway To Heaven.” Brown’s version includes an excellent fiddle break from band member Meredith Goins. Bluegrass fans love murder songs and disaster songs. “The Water and the Mud,” featuring Wyatt Rice as guest on guitar, tells of the disastrous loss when the moutainside gives way after too much rain, causing death that touches the man responsible for creating the problem. This could end up being a great campfire picking song. Another song that’s been around a while is “Last Day At Gettysburg” and Larry Sparks has a great version of it, but Still Lonesome does an excellent cover, also. That’s Tina Steffey on the clawhammer banjo on this cut. Jeff Brown and the young Still Lonesome band will make their mark in bluegrass with this CD. If you like your bluegrass in the Monroe/Stanley tradition, you owe it to yourself to listen to this. While fairly new as a music unit, Still Lonesome plays bluegrass music that showcases the years of musical experience spearheaded by Jeff Brown, who started playing with Larry Sparks as bass player and tenor singer in 1993. Brown worked as a Lonesome Rambler from 1993-1996 and continued to play various dates and recording projects until forming Still Lonesome. He has also toured with The Charlie Sizemore Band as well as pulling fill-in duties with Blue Highway and Dr. Ralph Stanley and the Clinch Mountain Boys. With performances on some of country music’s greatest stages, including the Grand Ole Opry, the Ryman Auditorium as well as television shows like Austin City Limits and PBS’s Song of the Mountains, Brown is a seasoned performer with a long history. The youth of the group positions them to be a future favorite in the genre. Meredith Goins handles fiddle duties and has studied violin at UTC’s Cadek Conservatory, Vanderbilt’s Blair School of Music and East Tennessee State University. She is a two time National Champion of Country Music Beginners at the Smithville Fiddlers Jamboree and first place winner of the 2011 Galax Fiddlers Convention. In 2003, she performed on the Grand Ole Opry with fiddle extraordinaire Aubrey Haynie, Vassar Clements, and Daniel Carwile at only the age of 14, and has since performed as a guest with The Boxcars, Roland White, Vassar Clements, Buddy Spicher, Wayne Henderson, and Melvin Goins to name a few. Floyd, VA native, Josh Blankenship, is a talented mandolin player, songwriter and vocalist, who has performed with Statement and Ashlee Blankenship and Blades of Blue. Banjo player, Josh Underwood, is also from Floyd, VA and brings his skills to the band as well as being a formidable songwriter and vocalist. He has performed with bands such as Statement, Makeshift, No Speed Limit, Ashlee Blankenship and Blades of Blue. Austin Brown on acoustic bass, is fifteen years old and sites musical influences such as Stanley, Tony & Wyatt Rice, Barry Bales, Larry & D. Sparks, Mike Bub, and more. By Bob Cherry, Cybergrass.com - Jeff Brown, talented former sideman for bluegrass music legend Larry Sparks, along with his band, Still Lonesome, have released their new albumBlue Side of Me on Mountain Fever Records. The single “These Old Blues” was released in April to an enthusiastic reception from radio DJs and fans. While fairly new as a music unit, Still Lonesome plays bluegrass music that showcases the years of musical experience spearheaded by Brown, who started playing with Sparks as bass player and tenor singer in 1993. Brown worked as a Lonesome Rambler from 1993-1996 and continued to play various dates and recording projects until forming Still Lonesome. He has also toured with The Charlie Sizemore Band as well as pulling fill-in duties with Blue Highway and Dr. Ralph Stanley and the Clinch Mountain Boys. With performances on some of country musics greatest stages, including the Grand Ole Opry, the Ryman Auditorium as well as television shows like Austin City Limits and PBS’s Song of the Mountains, Brown is a seasoned performer with a long history. Sparks himself said, Jeff Brown understands the music from the Stanley Brothers to Larry Sparks. Jeff did the tenor singing and played bass in my band for some time and continues to record some with me to this day. Our music needs someone to help keep it alive and I believe Jeff is one of those who can do just that. I hope to hear more from Jeff and his band in the future. The youth of the group positions them to be a future favorite in the genre. Meredith Goins handles fiddle duties and has studied violin at UTCs Cadek Conservatory, Vanderbilts Blair School of Music and East Tennessee State University. She is a two time National Champion of Country Music Beginners at the Smithville Fiddlers Jamboree and first place winner of the 2011 Galax Fiddlers Convention. In 2003, she performed on the Grand Ole Opry with fiddle extraordinaire Aubrey Haynie, Vassar Clements, and Daniel Carwile at only the age of 14, and has since performed as a guest with The Boxcars, Roland White, Vassar Clements, Buddy Spicher, Wayne Henderson, and Melvin Goins to name a few. Floyd, VA native, Josh Blankenship, is a talented mandolin player, songwriter and vocalist, who has performed with Statement and Ashlee Blankenship and Blades of Blue. Banjo player, Josh Underwood, is also from Floyd VA and brings his skills to the band as well as being a formidable songwriter and vocalist. He has performed with bands such as Statement, Makeshift, No Speed Limit, Ashlee Blankenship and Blades of Blue. Austin Brown on acoustic bass, is fifteen years old and sites musical influences such as Stanley, Tony Rice, Barry Bales, Mike Bub, and more. Mountain Fever has another new CD out today, Blue Side Of Me, from Jeff Brown and Still Lonesome. Brown is a powerful vocalist, with a sound reminiscent of Larry Sparks, with whom he once worked, and the great Ralph Stanley, who schooled Sparks at the early stage of his career. He is supported here by a fine band, composed of talented young musicians from Jeff’s native southwestern Virginia and eastern Tennessee. Brown plays guitar, Josh Blankenship is on mandolin, Meredith Goins on fiddle, Josh Underwood on banjo, and Austin Brown on bass. Wyatt Rice provides guest support on guitar, as does Tina Steffey on clawhammer banjo. In live shows, you might hear Jeff singing in a very primitive mountain style on a song or two, but the music here has a pronounced contemporary bluegrass vibe. Brown’s lonesome voice provides an interesting counterpoint to the more modern – but still traditional – sound of his young band. The Sparks repertoire is represented in These Blues, and Last Day At Gettysburg, both receiving a plaintive and emotive reading. There is even a Sparks-ish guitar kickoff on Hickory Switch. But don’t take the impression that this record is a tribute, or that Brown isn’t an individual artist with his distinct style. It’s just that the influence is both obvious and profound. Jeff also shows himself to be quite a songwriter, with four of the album’s twelve tracks being his co-writes with Becky Buller, Kris Rasnake and Greg Horn. A good example is the title track, written with Rasnake, which is right smack in the lonesome moan tradition, and Virginia I Hear You Calling Me (with Horn), telling about the love of home, with a roll call of cities and towns in the Old Dominion. Tim Tolliver contributes two songs, the aforementioned Hickory Switch, and The Water And The Mud, which tells of a disastrous flood. A spirited rendering of Merle Haggard’s Lonesome Fugitive closes out this strong set of songs from Jeff Brown and Still Lonesome. Blue Side Of Me is available from the band’s web site, and from popular digital download sites. Radio programmers can download the tracks from Airplay Direct. Click on link below to watch video from Bluegrass Today! Here's our Special Bluegrass Correspondent with a report on last weekend's Virginia Mountain Music Festival. We would like to thank Kalyn Price with Photography by Kalyn for her great photography work and designing the CD cover for Blue Side of Me. Jeff Brown and Still Lonesome are proud to announce that they have signed with Mountain Fever Records and release Single "These Old Blues" today. The CD - Blue Side of Me is tentatively scheduled for release in June. National release of Blue Side of Me on Mountain Fever Records is slated for July 16, 2013. You can order your copy today!!!! “I have known Jeff Brown for a quite a while now and he has proven to me over and over that he is a very good friend and a talented musician. I wish him nothing but the best!" "Jeff Brown understands the music from The Stanley Brothers to Larry Sparks. Jeff did the tenor singing and played bass in my band for some time and continues to record some with me to this day. Our music needs someone to help keep it alive and I believe that Jeff is one of those who can do just that. I hope to hear more from Jeff and his band in the future." "Jeff Brown and Still Lonesome are a band that is surely on the rise! A modern sound, yet grounded in a true mountain tradition. Musicanship and vocals that come from the heart and soul...that's what Jeff Brown and Still Lonesome deliver!" Jeff Brown & Still Lonesome is amazing! I had the chance to play on three cuts of their new CD, and it was a real pleasure to do so. Their song selection, and arrangements bring them into a sound of their own. Anyone who's into bluegrass should have this one in their collection. Superbly done!